Heeft u een vraag voor Bulul Garden Hotel? Bulul Garden Hotel is in en garandeert gasten een plezierig verblijf in Palawan, voor zowel zaken als plezier. Het hotel ligt slechts 268.1 Km van het stadscentrum: lokale bezienswaardigheden zijn dus snel te bereiken. Ook Parochi van St. Francis van Assisi, Tres Marias eiland, Caalan strand zijn eenvoudig te bereiken. Niets is te veel voor Bulul Garden Hotel om het haar gasten naar de zin te maken. Zo biedt deze accommodatie de beste services en voorzieningen. Deze accommodatie biedt ter plaatse vele faciliteiten die zelfs de meest veeleisende gasten zullen tevredenstellen. Bulul Garden Hotel beschikt over 4 gastenkamers. Deze zijn allemaal smaakvol ingericht voor optimaal comfort, met voorzieningen zoals plasma tv, internet (draadloos), draadloos internet (gratis), rookvrije kamers, airconditioning. Of u nu van fitness houdt, of gewoon lekker wilt ontspannen na een drukke dag, het kan allemaal dankzij recreatieve voorzieningen zoals duiken, tuin. Geniet van een geweldige locatie en ongeëvenaarde services in Bulul Garden Hotel. Op de meeste plekken zijn geen creditcardfaciliteiten beschikbaar. Buitenlandse valuta en reischeques in USD kunnen in sommige winkels gewisseld worden. Houd er rekening mee dat er stroomonderbrekingen op het eiland El Nido kunnen voorkomen. In sommige gebieden is er geen of beperkte internetverbinding. Schoon, zeer vriendelijk personeel, locatie. Top, als je niet pal aan het strand wilt zitten voor teveel geld, lijkt dit ons het beste alternatief. Zit geen eten bij, maar in El Nido kun je overal goed eten! Rooms were clean when we arrived but not once did they clean our rooms during our 3 nights stay. When I asked about periodicity of cleaning, they said they clean every 2 days. Did not seem so though. We had to ask them to take out trash bin full of dirty toilet paper. We had to use the same wet towels for 3 days because it is quite hard to dry them due to high humidity. It was surprising because we had much cheaper accommodations during our trip in Philippines where all these things were automatic. We also missed water purifier at the property. The green wall and the little hut at the bottom of the garden no longer exist, today there is only a concrete wall on front of the rooms. The rooms are comfortable and clean but nothing that justifies such a price. The location is close to the center but quite noisy for the rooms closest to the main road. This hotel would be ok at half its current price (and we did 1 month in the Philippines to be able to say that). Water was Brown, I don't think this is normal.. No cleaning if you leave, you have to ask for it! Nearby the road so it's a bit noisy.. Woman in charge is very nice and helpful. Just don't do your laundry there because you will not get everything back and it takes forever! This hotel would have been fine for, say, $15 per night. I paid far more than that, on the assumption that there is a correlation between cost and quality. I was wrong. The toilet seat was broken and kept falling off the toilet. There is a soap dispenser in the shower; it didn't work. For a room much cheaper than this in Manila the towels and sheets would be changed every day. Here they were never changed. But it is impossible to keep sand out of the bed. So each day the sheets became more and more filled with sand... As I said, if I had paid $15 per night I wouldn't complain. But I paid 3x that much. My recommendation is, if you can get the room for $15 per night, and if you are ok with a $15/night room, then you will be satisfied here. Don't pay more than that or, like me, you will be unhappy with the room. We were a group of 4 across 2 rooms and it was TIGHT! You could hardly move between the beds and there was very little room for bags and such like. Breakfast was very average and I dont think they did food at any other point of the day. Friendly enough staff who were quite helpful although laundry took a lot longer than they said it would. There are only 4 rooms at this hotel. The size of the rooms are only adequate for 2 single beds or one double, but they have put one double and one single in each room, so there is no space for any luggage or clothes. If you get room 4 then the generator is next to the room and there is no sound protection when it runs all night after power cuts. If you want your room cleaned then you need to leave your key with reception in the morning (they don't tell you that at check in). The staff are great and very friendly and try their best to help. Great room and fantastic service from the staff. Short walk to the beach and to the main stretch of restaurants and bars. Wifi was quite poor which made it a struggle to keep in contact with the rest of our group staying at a different hotel. Unfortunately it was a short stay, just 2 days... We would stay for longer time with a good pleasure. Very friendly stuff, clean rooms and nice garden. Perfect location, just 2 min walk to the restaurants/shopping area and the sea. Thank you! We enjoyed our stay! 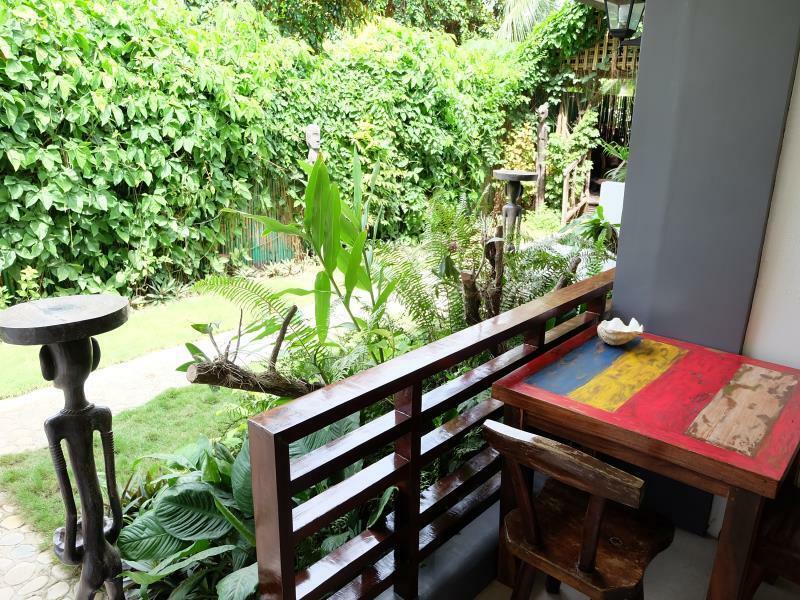 I enjoyed my stay at Bulul Gardens; after the trek of getting to El Nido it's fantastic to stay somewhere within a few minutes' flip-flopping of the beach! The wifi is somewhat unreliable and rooms are a little smaller than anticipated, but clean and comfortable! Comfort of the bed, Ultra accommodating staff, Icecream! We had an awesome stay here- the hotel itself was very cute, clean, and well-run. The shower was a pleasant change from many others we experienced on our Philippines trip (good water pressure and reliable hot water), we didn't experience any power outage issues, and the room was simple yet clean and perfect for this island town. We can't speak more highly of the staff- we were faced with a big problem due to a last minute flight change, and the ladies working here allowed us to use their phone, helped find complicated phone numbers, and helped change all plans so that we could catch our flight out of Puerto Princesa earlier than expected! The breakfast wasn't available until after 7 (too late for our early bus out of town, which was a bummer) and was just "okay" (we ended up eating at Art Cafe most mornings), but we loved the private dining tables on our patios! Would definitely recommend this hotel to others, and would stay here again! We had an amazing stay, the staff were super friendly and incredibly helpful. They were very accommodating during our stay, the staff had no problem keeping left overs and food in their fridge for us (there are no fridges in the rooms) and went out of their way help with any requests. I'll definitely be staying here again if I ever go back to El Nido! it was a good place but in my opinion too pricey if you are just going to be out of your hotel the whole day to be on tour or you will arrive at night just to sleep coming in from the 5 hr bus ride from Puerto Pricesa. They have hot water BUT the water pressure there is sooooo low that i was at the end of my shower and the water just stopped. It came back on at about 3AM!!! Also they have NO cabinet/closet, no place to hang your clothes! They serve breakfast at php 150 a plate which isn't so bad plus they serve it at the small balcony outside your room. Their wifi signal is also very weak. The location is good though just along the main road and you can walk to look for food or drinks. A bit far from the beachfront but the downtown area of El Nido is so small everything is all walking distance. All in all a nice place but too pricey for a place you just use to sleep and shower after being on tours the whole day. Don't expect if to be too fancy, but it is very clean and pleasant and we were very happy to stay there. The staff was outstanding and helped us with everything. The WiFi was slow but it didn't matter for us that much because there is free WiFi in every restaurant/cafe in the island.